A new report from the Commission for Regulation of Utilities (CRU) has revealed some interesting facts and stats concerning the energy market. 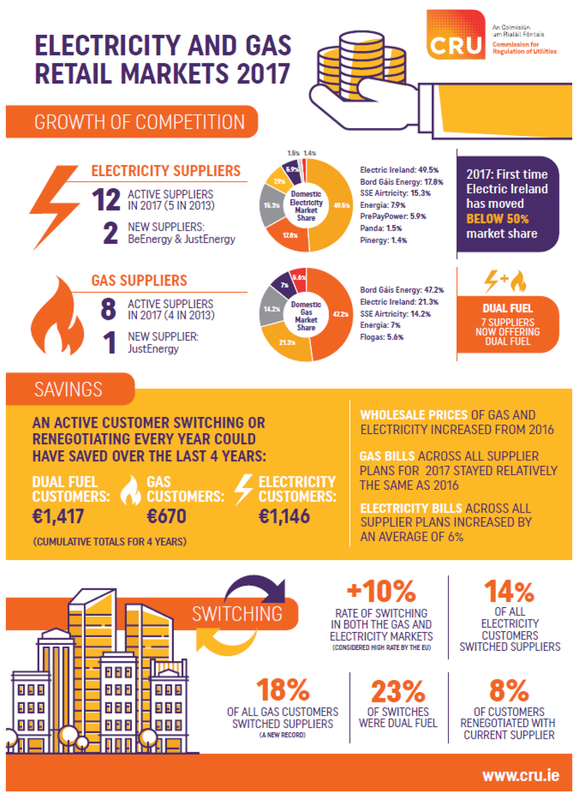 The most compelling statistic proves the saving power of switching, as it was revealed that an average customer switching suppliers over the last four years could have saved over €1,800 euro! The CRU’s annual electricity and gas retail market report for 2017 was recently released and comes bursting with interesting info concerning the development of competition in the electricity and gas markets over the last year. We know you’re a busy reader, so let’s not get too bogged down with the extensive specifics of the report, and cut right to the chase to reveal the most compelling details for the average the energy customer; namely, those that can help you save you time and money! For the first time since the energy market was deregulated a few years ago, Electric Ireland (formerly ESB) saw its market share fall below 50%, with the company now holding 49.5% of the energy market. Bord Gáis Energy continued holding the second greatest market share by consumption in Q4 2017 with 17.80% (though it still holds the greatest gas market share with 47.2% of the market by customer numbers), followed by SSE Airtricity with 15.36%. The remaining key suppliers are Energia with 7.96%, PrePayPower with 5.99%, Panda with 1.51% and Pinergy with 1.46%. There are now a total of 10 gas and electricity suppliers in Ireland (up five since 2013) offering energy in the domestic sector (with seven of those offering dual fuel options), which is great news for consumers - more competition means more choice! Since the energy market was deregulated a few years ago and more options have become available to energy customers, levels of switching have continued to increase. In 2017, the electricity switching rate was 14% and the gas switching rate was 18%. This is the highest gas switching rate recorded to date. Of total switches, 23% were dual fuel switches. Switching rates in both the electricity and gas markets are above 10% in Ireland, which globally ranks well in terms of switching rates. In total, 438,262 gas and electricity switches to new suppliers were made in 2017 and new data on internal switching and dual fuel switching shows that there were also a significant number of internal switches. Approximately 8% of electricity customers and also approximately 8% of gas customers renegotiated their contracts with their current supplier. So if the above data tells us anything it’s that Ireland has developed an appetite for switching. In 2017 a total of 22% of electricity customers and 26% of gas customers looked for a better energy plan through either switching supplier or renegotiating with their current supplier. And those of us in the know, are aware that there’s a simple reason for so much supplier hopping. It’s simple. It’s easy and it saves money. According to the CRU, if a customer had switched to the best available discount tariff each year for the past 4 years they could, over the course of the 4 years, potentially have saved up to €1,146 on electricity; €670 on gas; and €1,417 on dual fuel. Of course, there are other driving factors besides price (though price in undoubtedly the main one). For example, green energy is becoming an important factor in customer decisions, with 43% of customers last year claiming that a supplier’s capability to provide energy from renewable sources would influence their choice of supplier. Though overall the 2017 consumer survey found high levels of customer satisfaction with all suppliers, levels of knowledge and awareness across customers in terms of tariff structures, energy offers and bill configuration are low. The survey also found low levels of repeat switching. Data suggests that of those who switched supplier in the last 12 months 65% (domestic electricity) and 50% (domestic gas) defaulted to a standard tariff when their initial discount period ended. We’re not surprised concerning these two findings in particular - energy tariffs and discount price plans can be tricky to figure out when you’re trying to do it on your own! It’s why comparison website like bonkers.ie exist - to make the switching process as quick and easy as possible. Most of Ireland’s suppliers offer heavily discounted rates to their new gas and electricity customers as a sign-up incentive. This means when you sign up as a new customer you’ll get a discount on your energy bills for a predetermined period of time, typically the length of a standard contract (12 months). When this period comes to an end i.e. when your contract is over, if you don’t switch, your supplier will revert your plan to standard pricing and you’ll pay more for the exact same service. So, if you remember to switch suppliers every year, you’ll ensure that you’re always on a discounted rate, which means you’ll never pay over the odds and you’ll always get the very best value for your money. No brainer, right? Ready to check out your options? If you haven’t switched energy suppliers in the last 12 months, you’re almost definitely paying more than you have to. Why not check out our energy price comparison calculator and see how much money you could save? Considering that eight out of Ireland’s twn energy suppliers recently announced imminent price increases, now couldn’t be a better time to get on the best discounted rate out there and safeguard yourself against shock bills come winter time.